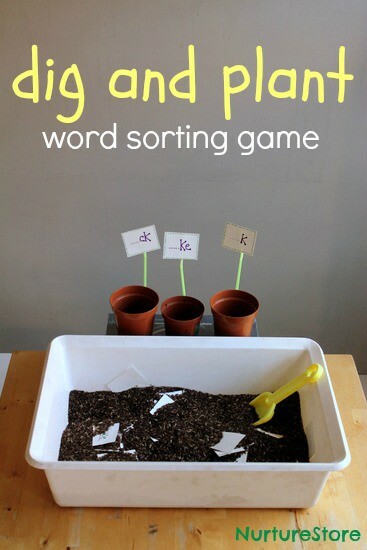 We’re giving our learning a Garden Classroom-theme with these ‘dig and plant’ word and colour sorting games. 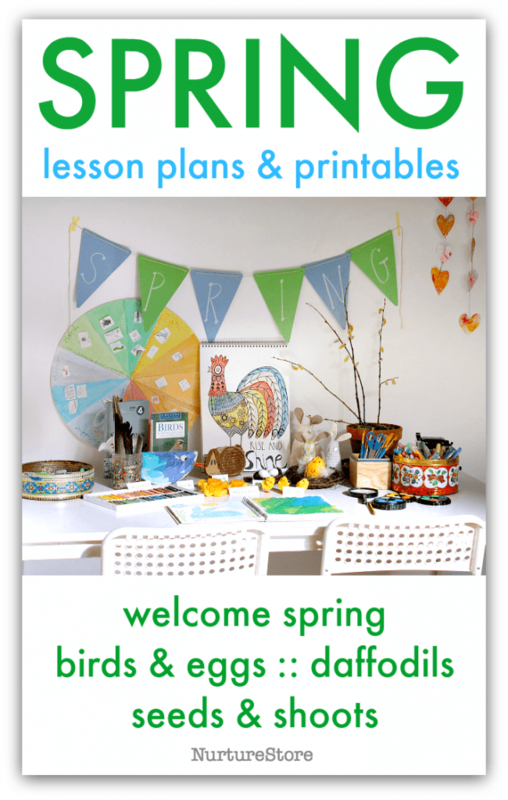 I do like activities and play materials that can be used in lots of different ways. It means we can re-use materials, and adapt our games to suit children of different ages. 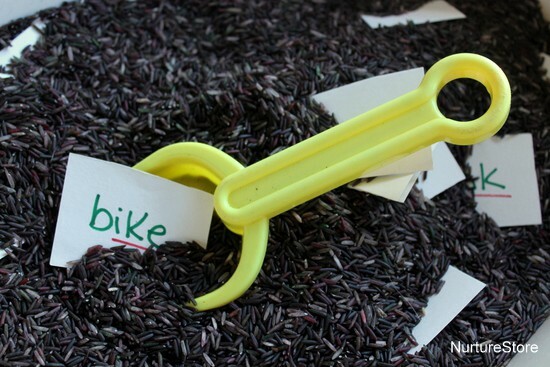 For these sorting games we’re using a tub of dyed rice previously seen in our pretend play farm and our spring sensory tub. This time we’re using the tub to work on some spellings. I made a set of word cards to hide in the ‘soil’. My daughter is working words ending in a ‘k‘ sound, so all our words end with either ‘…ck‘, ‘…ke‘ or ‘…k‘, but the beauty of this game is that you can adapt it to suit each child. So you might sort capital and lower case letters, words beginning with ‘a‘, ‘b‘ and ‘c‘, or words spelt with ‘ch‘, ‘th‘ or ‘sh‘ – whatever you want to work on. 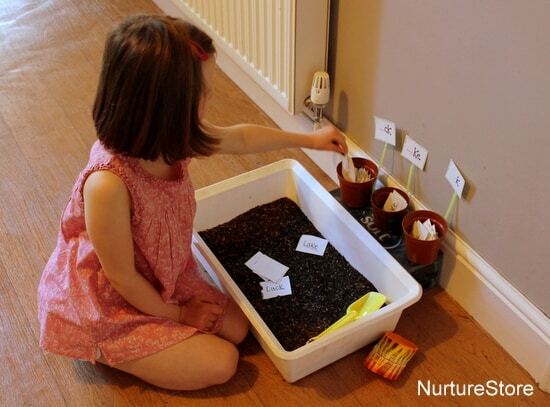 At one end of our game tub we have a set of plant pots with seed labels showing each type of word. I made these with a piece of card and drinking straw, taping them to the plant pots with sticky tape – super quick and easy to set up. 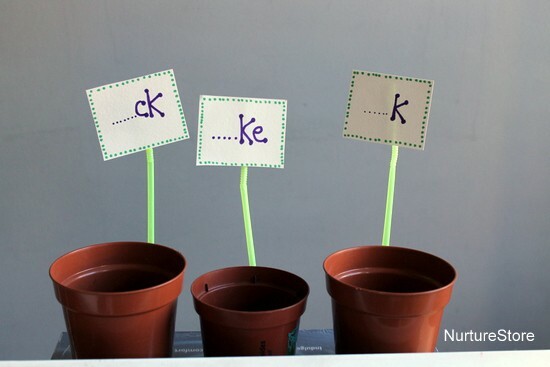 The idea of the game is to go digging, pull up a word, and plant it in the right plant pot. 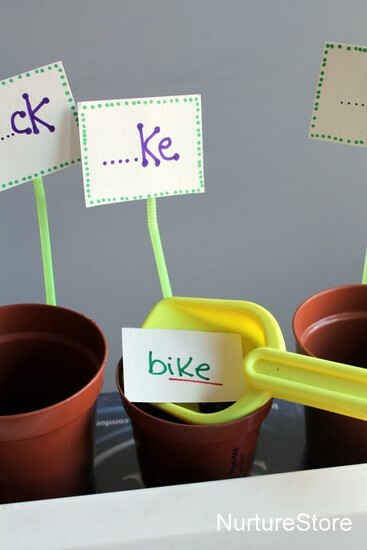 It’s a fun, hands-on activity that lets your child enjoy some spelling practice. This kind of word sort can be really effective in helping children spot, learn and use spelling rules. They have to read each word, think about the spelling rules they know, and classify this particular word in one of the groups. And doing this by using a textured tub is a good way to include different sensory-elements in your classroom. You can use this same game idea for maths activities too. Sort odd and even numbers, or for younger children, try this colour sorting game. Swap the ‘letter’ plant labels for some colour-coded ones and fill the tub with an interesting mix of items in the colour groups. 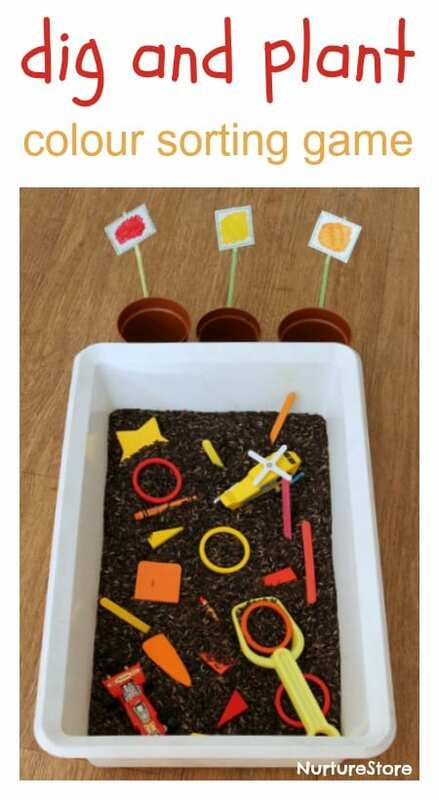 Then dig away and see if you can plant each coloured item in the correct plant pot.